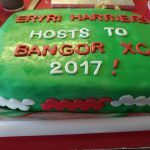 Bangor cross-country this weekend was muddy to say the least! Massive thanks, as every year, to everyone who was part of making it go smoothly. Trefor Jones, Matthew Fortes, Stuart McDonald, Maggie and Alwyn Oliver and Arwel Lewis all helped with setting up and marking the very wet course, including running around in the days prior making sure the course was clear. Ellie Salisbury, James Harwood and Lesley Lawson did a great job with car parking duties. Iorwerth Roberts, Trefor (again! ), Tina Louise McDonnell, Sioned Ellen Rowlands and Eurwyn Edwards donned the hi-vis and marshalled the course, with Mair and Wills, Jenny Heming and Lesley expertly doing the timing and helping at the finish. 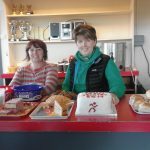 Cake and a panad from the wonderful Ann Lewis and Karen Jenkinson raised lots of money and paid for the first aiders – the cakes were fantastic, cheers everyone! Special thanks to Siabod Cafe and Theresa Davies for their amazing themed cakes! Huge well done to all 28 runners too – very challenging conditions for all and a slightly longer race (400m approx. but bet it felt like more through the mud!) for the ladies, O70s and U17men. Hailstones, sunshine, rain, wind, cold all round! Fantastic achievement from Callum OD who won the first race of the day (MU17)! Andrea Rowlands was first Eryri lady home following a very strong run, followed by Elliw Haf (first XC race, nice one! ), Megan Hughes, Helen Blair, Ellie Salisbury, Lesley Lawson, Hayley Turner, Tamsin O’Neil, Alexandra Fletcher, Alison Donnelly, Maggie Oliver, Viv Edwards and Becca Roberts. Geoff Fielding was 77th overall representing the O70s. Well done everyone! 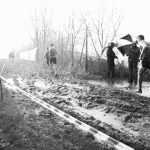 In the second race of the day, having to battle through the churned up mud, Aled Gwyn Owen was 11th, followed by Matthew Fortes in 16th (having spent 3+ hours marking the course in the morning!) followed by Owain Williams, Steve Jones, Emlyn Owen and Craig Jones (having started the race late!). Ben Beachell was next, followed by Arwel Lewis, Derek Weaver, Paul Hodges, Steffan Rhys Evans, James Harwood and Barry Davies. Great job all – fancy coming to Shrewsbury and Oswesty in January/February!? 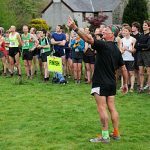 NORTH WALES XC CHAMPIONSHIP, Rhug Estate, Corwen, LL21 OEH – pre-entry essential – see NWXC league website. NEXT LEAGUE FIXTURES – 20th January, Shrewsbury and 3rd February, Oswestry – bus provided, more details to follow. Black and white photo is amazing whoever took it – thanks! Huge well done to three Eryri Harriers who flew the flag in Liverpool at the British Athletics Cross Challenge 2017-2018 on Saturday this weekend. Rob Samuel was 40th in his race of a strong field of 525 runners. Bronwen Jenkinson was 19th in her category (69th overall) in another strong field of 326 runners. Annabelle McQueen was a brilliant 41st in her U20W race too! Fantastic running and massive well done to you all – it looked tough going in Liverpool as well! 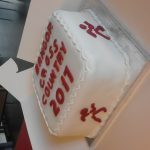 Whatever happens, please bring CAKES for the cake stall if possible – this is a great source of income for the club which helps us buy things like course marking flags and other stuff! It all kicks off at 2pm with the first race of the day (all ladies, U17men and O70 men), and 2.45pm for all other mens categories). 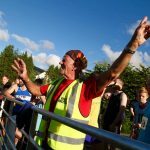 Please make sure you are a full member of Eryri Harriers and you wear your vest if you are running – we need your help to field a team at our home fixture so please come along and enjoy! Any queries, drop me a line, more than happy to help/advise. Cheers all and see you Saturday! 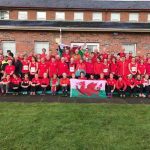 Congratulations to the 14 Eryri Harriers who have been selected to run for North Wales in this years inter-regional championships XC in Brecon on 9th December. Eryri runners selected (but not all can run due to other committments) include: Rob Samuel, Matthew Fortes, Richard Roberts, Russell Owen, Stephen Jones, Arwel Lewis, Bronwen Jenkinson, Becki Law, Andrea Rowlands, Lesley Lawson, Helen Blair, Tammy Ddrwg Lewis-Jones, Annie Williams and Viv Edwards – well done everyone! 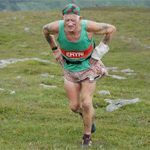 Six Eryri Harriers ran at Rhobell Fawr on Saturday – Matthew Fortes was third overall (2nd V40), Dyfed Whiteside Thomas 3rd V40, Emlyn Roberts 3rd V50, Iwan Edgar 1st V60, Harri Roberts and Becki Law – da iawn everyone! 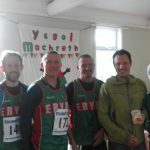 Great day at a wonderful fell race – village hall, lovely route, beautiful fells, friendly runners and marshalls, soup, amazing cakes – many thanks to Meirionnydd running club!